Laura Petri was an officer of Frälsningsarmén (the Swedish Salvation Army). She was also a researcher and an author on the subject of church history. Laura Petri was born in 1879. She grew up in an upper-class environment in Halmstad. Her father, Carl Magnus Petri, was a teaching instructor and also worked as a hospital priest. Her mother, Charlotta (née Nyman), was a housewife. Laura Petri had a solid education and graduated from school as a private student in 1898. The preceding year her elder sister, Alma Petri, had joined the Swedish Salvation Army and Lauri Petri wanted to follow in her footsteps but had to wait until she had reached the age of majority. The Salvation Army had opened a mission in Halmstad soon after the organisation became established in Sweden. In her autobiography (see below) Laura Petri recounts her memories of the mission’s arrival in her hometown in 1887. The Petri sisters were drawn to the Salvation Army for several reasons. The desire to undertake social work of various kinds was widespread among the daughters of the bourgeoisie. The glow of a hero’s halo shone over those who engaged in this kind of work and the Salvation Army offered opportunities for such activity. Furthermore, through the Salvation Army both men and women were given a platform on which to exercise positions of authority and to speak publicly in terms of testifying and preaching. Laura Petri undertook officer training at Frälsningsarméns Krigsskola (the Salvation Army military school) in Stockholm. Her first appointment was on the editorial board of the magazine Stridsropet. She then became the manager of a refuge for female prostitutes in Stockholm. She worked intensively there until 1913 when she fell into a disagreement with the leadership of the Swedish Salvation Army. She also suffered from a breakdown at this point and this led to her spending almost three years in various hospitals and rehabilitation centres. She wrote about these experiences in her autobiography entitled Jag anklagar, 1916. After her recovery she began to study at Gothenburg College in 1916 and graduated in 1919. She then went on to Lund University to continue her studies. She obtained her Bachelor’s degree in 1920, and submitted her thesis the following year. Both of her degrees focused on the Salvation Army. She had solid experiences of the subject under study and had undertaken comprehensive research into the movement. Her doctoral thesis became the subject of lively discussion between the faculty professors and experts. Her thesis was not passed, but only by the slimmest of majorities: nine votes against, eight votes in favour. Laura Petri’s reaction to this decision remains unknown. 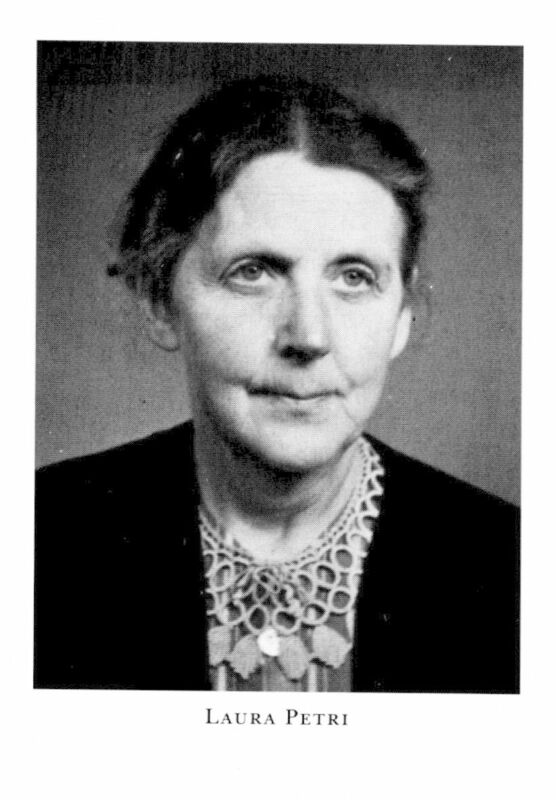 By 1922 she was in Tübingen undertaking further studies, and four years after her failed attempt at Lund she submitted a new thesis on the founder of the Salvation Army, Catherine Booth. This time both her submission and her defence were fully accepted and she was awarded her doctorate. Her thesis on Catherine Booth was one of the first researched works on the movement’s founder. The fact that Laura Petri opted to write about Catherine and not William Booth implies that Laura was making a point about Catherine Booth’s significance for the history of the Salvation Army, in general, but also for the role of women within that movement. Laura Petri was an active member of the Swedish Salvation Army for many years. Even after she had resigned from operational duties she carried on studying and writing about the organisation, particularly about its prominent female leaders. In addition to her thesis on Catherine Booth, Laura Petri also wrote a biography of Hanna Ouchterlony, the founder of the Swedish Salvation Army. Both of these books can be seen as classics in their field. Laura Petri also wrote a book on John Wesley and another about Ignatius of Loyola. She also maintained her activism on behalf of social outcasts. She returned to her hometown of Halmstad in 1925, where she settled permanently, and toward the end of her life she opened a home for the elderly, Västersol. The activism she had once enjoyed within the Swedish Salvation Army left its mark on her for the rest of her life. Laura Petri died in 1959 as the result of a car accident. Ingrid Laura Hildur Petri, www.skbl.se/sv/artikel/LauraPetri, Svenskt kvinnobiografiskt lexikon (article by Gunilla Gunner), retrieved 2019-04-24.